Lord I look so tired on these pics :/ I actually wanted to censor my eyes (like I did on one post before haha) but then I got lazy and I was like 'whatever' haha. I really need some sleep guys .___. Anyway, I'm in love with this shirt! It's so pretty and chic, and you can wear it in different ways! Hope you like the outfit though! Mon Dieu j'ai vraiment l'air fatiguee sur les photos :/ Je voulais meme censurer mes yeux (comme je l'avais fait sur un article precedemment haha) mais apres je me suis dit peu importe haha. J'ai vraiment besoin de dormir .____. Bref, j'adore la chemise! Elle est jolie et chic, et on peut la porter de differentes manieres! J'espere que vous aimez la tenue quand meme! j'adore, tu es superbe ! I just love it and u are wearing black and white ...Oh yees!!! You look so pretty! 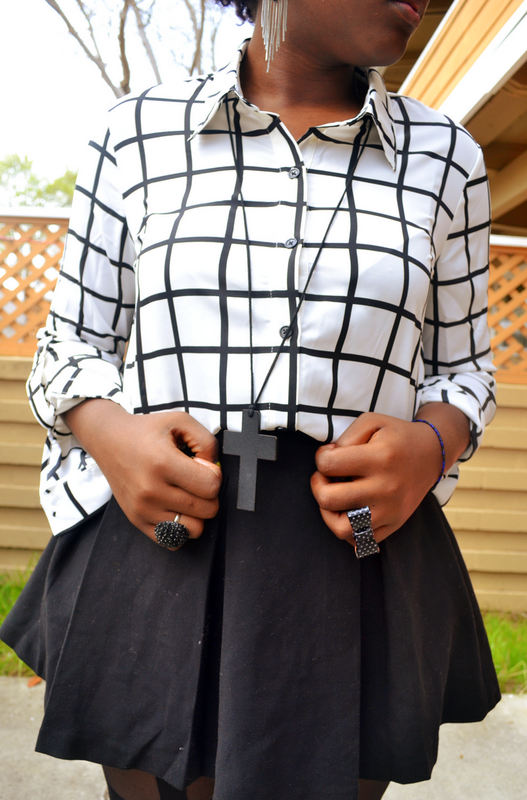 I love this whole outfit, the top is so versatile. what brand and color did you use? I love that top! I usually prefer stripes for black and white but this top is really nice. I like the tights as well but I'm not as brave as you to rock them. Cute! jolie!! j'adore comment tu as combiné les rayures et la couleur unie!! tu as l'air vraiment épuisée sur cette photo!! repose toi bien! so cute! i have a similar top like that and i love how it goes with everything. J'aime beaucoup ta jupette !